When does a ring fit? 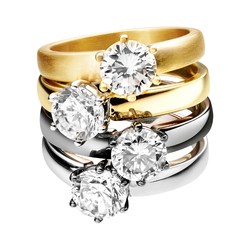 To ensure that your ring fits well, it is important to determine a suitable ring size. This means, that your ring should neither be too loose nor too tight. Should you have the feeling that your ring could easily slip off, or that it hinders your movement, your ring size might not be ideal. Please be aware that the size of your fingers may change slightly according to seasons, daytime and age. Fingers are generally thicker towards the evening (when they are warm) as apposed to mornings (when they are cold). High temperatures in summer may also have this effect. If you are debating between two sizes, we recommend you to choose the larger size. 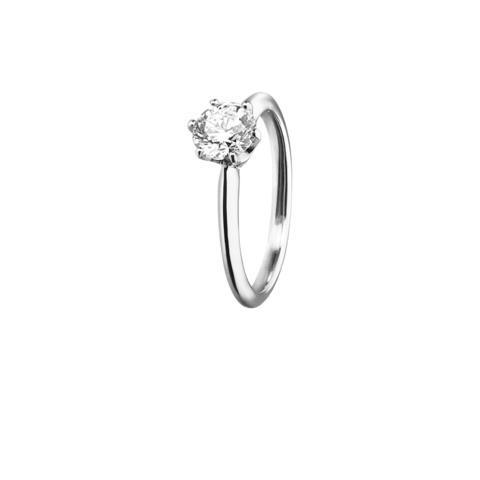 The ring width is another crucial factor when determining the right size for a ring. 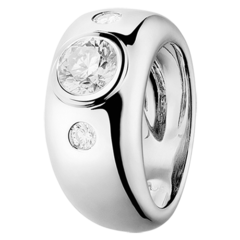 A wider ring – such as a broad men's ring or other generously designed rings – should be chosen in a larger size. Delicate rings with a slender band are more suitable in smaller sizes. For women, ring sizes typically vary between 49 and 59. 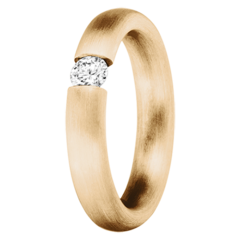 The most common ring sizes for female customers at RENÉSIM are 50 to 53. For men, ring sizes typically range from 56 to 69. 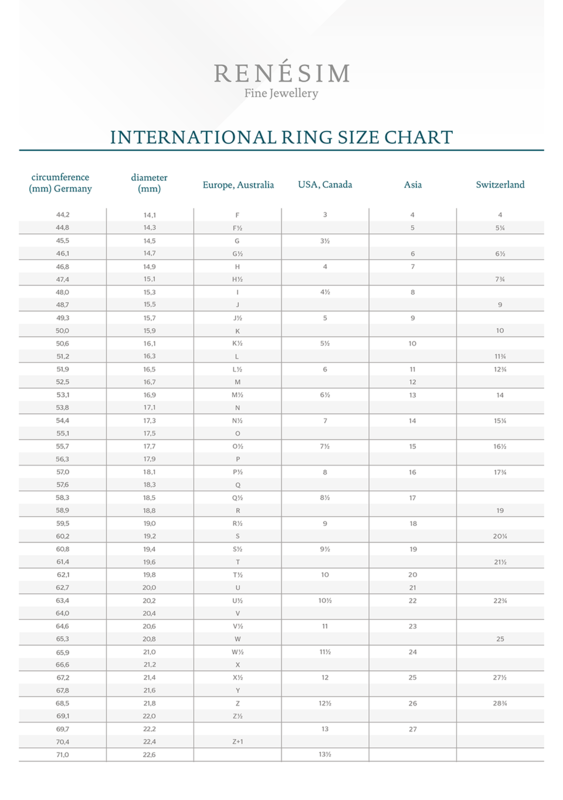 The most frequently chosen ring sizes for our male customers are 58 to 63. 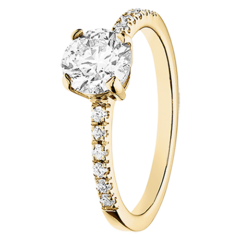 Should the person's best friends, or relatives not know the ring size then you may choose to compare it to a similar ring, that the person wears often. Keep in mind that the ring should fit on the correct finger. Place the ring on a piece of paper, next to a ruler, and send a picture of the ring to us via email service@renesim.com. 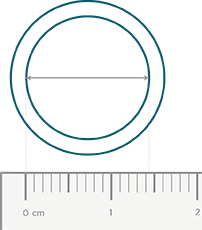 From the image, our team can quickly and accurately determine a suitable size. Trying to determine your exact ring size? 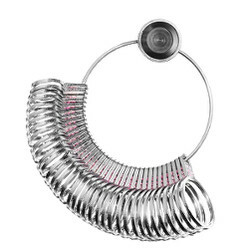 We recommend our high-quality metal ring sizer, which helps you determine the right size with many different alternatives. Incase your measurements should be off, RENÉSIM will adjust your ring size for any ring purchased with us with no extra charge. Call us at +49-89-1222893-0 and talk to one of our personal shopping assistants or contact us via email service@renesim.com. In addition to our large range of Diamond Rings in numerous designs, RENÉSIM also allows you to personalize your jewels or to generate truly unique creations.